Nearly all divorces settle out of court. Trials are public, can be expensive and a judge’s ruling can be unpredictable so many couples prefer to try and reach a divorce settlement agreement out-of-court when possible. To get what you want out of a divorce, it is helpful to identify your priorities whether it is staying in the marital home or holidays with the kids, there are many issues to consider. You, and likely your spouse, will have a list in mind of ‘must haves’ versus things that ‘would be nice to have’, which is a good place to start negotiations. Couples who come to the table with solid and realistic goals can often find common ground where they overlap, making an agreement possible. If both parties feel that the agreement took their wishes into consideration even if there was a bit of give and take, they will be more likely to negotiate a divorce settlement agreement that will reduce their chances of having to return to court with post-divorce issues. Of course it is often difficult to negotiate an agreement for yourself in a divorce. The division of marital assets and debt, parenting time and parenting responsibility, and the payment of spousal and child support are all issues that can often be more effectively handled by an attorney who is not caught up in the emotions of the divorce. Their job is to reach a fair settlement on your behalf, with your goals in mind, exploring all issues thoroughly so that you and your spouse reach an agreement that stands the test of time. Even if you believe that you and your spouse agree on everything, it is always a good idea to have legal counsel to review what you have in mind before signing anything so that you can be confident all issues have been addressed. 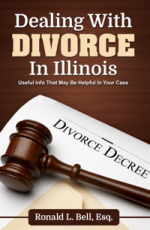 If you are considering divorce and have questions regarding Illinois divorce, marital property division, child custody and visitation (parenting time and responsibility), Illinois spousal support or child support, contact the Libertyville family law offices of Ronald L. Bell PC & Associates for more information today at 847-495-6000.